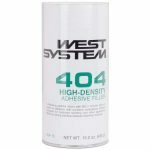 West System 404 High Density Adhesive Filler - Goosebay Sawmill and Lumber, Inc.
404 High-Density Adhesive Filler is an epoxy thickening additive developed for maximum physical adhesive properties in hardware bonding where high-cyclic loads are anticipated. It can also be used for filleting and gap filling with epoxy where maximum strength is necessary. It cures to an off-white color.